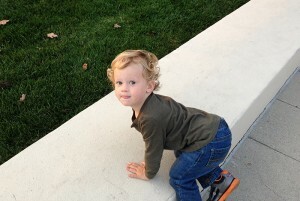 This ParenTip is based on my observations of a 20-month-old little boy who lives in California, a short plane ride away. Joshua is an adorable, happy, bright, talkative, curious, friendly little guy. Both his parents are loving, devoted, and dedicated to being the best parents they can be. Mom works during the day so Dad is the primary caregiver and they both get high marks both for parenting skills and style. You figured it out: Joshua is my grandson and we had a wonderful visit. I was amazed at what a good kid he is. (As a grandmother I am being as objective as possible, but you all know how grandparents are!) I noticed, or was asked about, four parenting issues. First of all Joshua is just about off the chart in height. He’s not overweight but he is big. People (and parents) can assume he is older than he is. He could easily pass for 2 1/2 as he is both tall and very verbal. But there is a huge maturity gap between 20 months and 30 months so his behavior does not match his size. Josh is not yet two so, of course, he still does babyish things. When I arrived I got a big smile but he then ran to his Mommy before he felt comfortable enough to hug me and sit on my lap while we opened the little book I brought. We read for a bit and then he swatted me. It was not a slap, more an exploratory gesture, a “What happens if I do this”? What happened was I said, “No, Joshua, no hitting.” And eased him off my lap. Both parents also said “Joshua , no hitting.” I did not observe another swat either at home directed toward grownups or at the park directed towards other children. With big-for-age kids, parents have to be especially careful when the child is in a same-age play group. Stay close enough to protect the smaller kids. Also when a big-for-age child is playing with older children, the older kids might shove him aside because he is such a baby. When such a child starts child care or preschool, talk with the teacher about how to best deal with such a child. Second, Joshua refuses to sit in a high chair. He can use both a spoon and a fork (to spear pasta) but he prefers to eat finger food from the table while walking around. “Grazing” may be a good way for the human animal to eat but the world is scheduled around mealtimes. I suggested easing Josh into the habit of sitting down at mealtimes to eat. Tell if he sits down he will get a trip to the park after lunch (bribing works!) Have a family meal as often as possible or at least a couple of times a week . Try special “party” meals with festive food where everybody dresses up. Take him to restaurants as a special treat so he will learn the rule is to stay in his seat and not fuss. Pick the restaurant carefully, ask for crackers or bread while waiting for the food, and bring little things to entertain him. Like crayons and paper. Joshua still eats crayons but Mom or Dad can draw animals or funny faces. Third, Joshua does not like a sippy cup so still uses and carries around a bottle. His parents correctly limit his milk and give him water not juice. My suggestion: Tell him the Bottle Fairy is coming soon. In a few days she will pick up all the bottles and take them to little babies who still need them. She will leave Josh a treat! (hide one bottle in case the child gets sick and needs fluids). Use both sippy cups and small plastic glasses or cups. Straws may help in the transition. This entry was posted	on Thursday, May 15th, 2014 at 3:30 pm	and is filed under Parenting Skills. You can follow any responses to this entry through the RSS 2.0 feed. You can leave a response, or trackback from your own site.